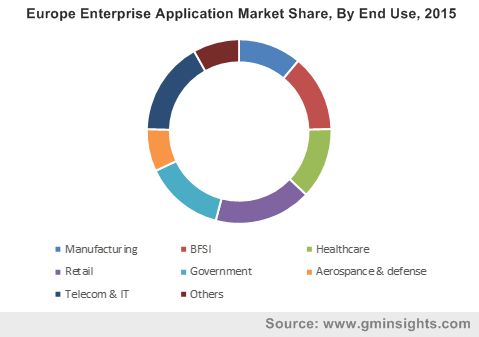 Enterprise Application Market size was valued at USD 150 billion in 2015, and is anticipated to grow at 7.6% CAGR from 2016 to 2024. Implementation of these solutions enables real-time flow of information and smooth business processes execution. Effective usage helps in better customer engagement and inventory management. In addition, it also aids in value enhancement through better supply chain management. This in turn is expected to propel global enterprise application market size from 2016 to 2023. Solutions such as business process management and business intelligence empower companies in tracking customer behavior and provide better knowledge regarding customer’s changing needs as well as lifestyle. Furthermore, capability to monitor social media such as LinkedIn and Facebook are expected to catapult growth over the next eight years. Cloud enterprise application industry share is likely to gain prominence owing to low technology infrastructure cost and increased accessibility offered. Growing internet infrastructure is predicted to drive the cloud-based solution adoption over the forecast timeframe. Increasing competition across numerous industry sectors such as retail and manufacturing along with rising focus on expenditure optimization is expected to drive revenue from 2016 to 2024. Increasing preference for remote access and emergence of smartphones is anticipated to surge data & VAS usage and in turn facilitate industry demand. Furthermore, availability of multi-functional as well as cost-effective products is anticipated to positively impact revenue. Rising consumer preference for multimedia devices coupled with growth in mobile devices is expected to propel demand. Multimedia-enabled devices provide more features with more data security over the Internet. Availability of open source solutions may hinder growth. In addition, it may act as a substitute to applications involving high maintenance and implementation costs. Furthermore, extra staffing requirement is likely to pose a challenge to industry participants. ERP market accounted for over 20% of the enterprise application industry share in 2015. The segment is forecast to grow at 7.7% CAGR from 2016 to 2024. Rising need to automate back office and need for real-time information flow is predicted to propel growth. CMS (content management system) segment is forecast to witness significant growth prospects owing to escalating demand for website content management. It is predicted to grow at 13.5% CAGR from 2016 to 2024 to be valued at over USD 8.5 billion by 2024. CRM (customer relationship management) sector has benefitted from escalating awareness regarding customer engagement management. It is estimated to account for over 25% of the market share by 2024. The healthcare segment valued at over USD 16.5 billion in 2015 and is projected to grow at 8.9% CAGR from 2016 to 2024. This can be credited to rising need for real-time data transparency across the sector. Retail segment accounted for over 15% of the revenue in 2015. Growth in the sector can be attributed to swift adoption of these solution for enhancing value proposition as well as customer experience. It is debatable as to which software is more profitable for organizations, and implementation decision is based on customer requirements. For instance, cost saving through open source software implementation may not offset the implementation time and extra staffing. Cloud based enterprise application market size is expected to experience substantial growth prospects owing to high accessibility, disaster recovery, effective project monitoring and minimal capital involvement offered. The segment accounted for over 30% of the revenue in 2015. On-premise end-use segment is forecast to record considerable growth rates owing its rising adoption for in company premise computers. It is estimated to grow at 4.5% CAGR over the next eight years. These solutions help companies in connecting every process and enable smooth flow of information across different departments. In addition, they are helps in converting unstructured data into actionable information. For instance, various companies use CMS to upload and manage website content. It is likely to witness rapid adoption owing to efficient content lifecycle management and ease of use. U.S. market was valued at over USD 30 billion in 2015, with the North American industry likely to account for more than 30% of the revenue by 2024. Growth in the region can be credited to dynamic organizational structure paired with companies’ customer centric approach. Asia Pacific is forecast to record substantial growth prospects owing to surging number of startups accompanied by existence of massive number of small scale industries across the region. It is forecast to grow at 9.5% CAGR from 2016 to 2024 and is projected to be valued over USD 75 billion by 2024. This can be credited to emergence of cost-effective Chinese manufacturers such as Xiaomi and Huawei. Technological advancements and development of innovative, lightweight, and compact, devices are likely to offer potential growth avenues. Key industry participants contributing to the market share include IBM, Microsoft, Oracle, and SAP Other prominent industry players are Epicor Software, Hewlett-Packard, IFS, Infor, and QAD. Players in the industry practice high degree of innovation and customization to provide unique solutions to existing and potential customers. Intersegment rivalry is high owing to the presence of large number of solutions such as such as ERP, CRM, BI, BPM, EAM, CMS, and web conferencing. The industry expects hybrid solutions that can be delivered through both on premise and cloud models to gain popularity. The industry is forecast to invest considerably in R&D in order to maintain share and competitive edge. These solutions are likely to become a standardized offering; industry players are looking forward to add value through innovation. The standardization process is likely decreases over the timeframe, while new features are forecast to increases value proposition. Big data emergence is anticipated to offer potential opportunities to several businesses by efficiently managing valuable streams of data and transform it into meaningful information. High usage across retail and healthcare sectors is estimated to drive demand over the forecast period. Furthermore, data harnessing in public as well as manufacturing sectors is expected to provide several growth opportunities.